The Polar Bear is an extremely large animal, with the males weighing up to 1,500 pounds. The females are only about 800 pounds when they are full grown. Males can be up to 10 feet in length with the females only about 8 feet long. The body of a Polar Bear is very different from that of other types of bears. They claws of the Polar Bear are very sharp as well as designed to make it simple enough for them to walk across the snow and the ice that is plentiful in their natural habitat. The body of a Polar Bear is very long and they are detailed for specific types of movements. As you watch a Polar Bear move on land, you will notice how powerful each stride is. They feature a very long skull as well as a long nose. They have short but stocky legs that they use both for walking on land and to help them swim in the waters. Many believe that the small size of the Polar Bear’s ears and tail don’t match the rest of their body! Even though the Polar Bear has very short legs, they have long feet. This too seems somewhat out of place. It is believed this design of their feet though helps them to evenly distribute their weight as they move around. They also help them when it comes to swimming which is important considering how much of their lives they do spend in the water. To help protect their feet, there are pads on the bottom of them. They are designed to give them plenty of traction for walking on the slippery ice. The claws are much shorter than those of other species of bears. They are designed to allow the Polar Bear a way to easily dig and to scoop the ice. 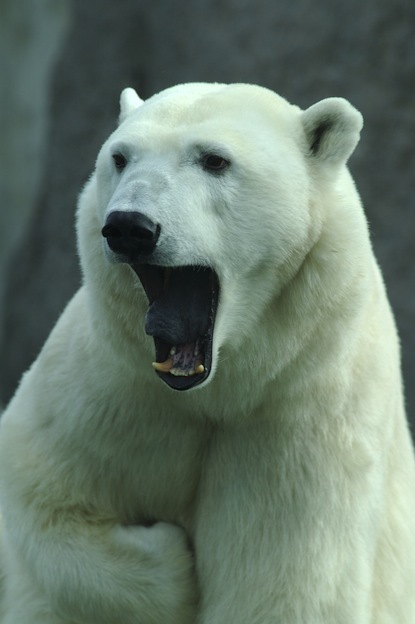 Polar Bears have a mouth full of 42 extremely sharp teeth. Since they are carnivorous, they need them to kill their prey as well as to consume it. Their teeth are longer and sharper than those of the Brown Bear. They fur of a Polar Bear is either white or tan and very thick. They have several layers of it to keep them warm in the colder region. They also have layers of blubber that further insulate them as the colder times of the year approach. As Polar Bears get older, it is common for their fur to take on a yellowish color. The sense of smell is amazing for a Polar Bear and they use this part of their anatomy to find prey and to identify any type of danger that could be lurking around them. It is believed that they can smell scents up to a mile away. They also have very good hearing and vision which makes them tough predators to get away from. They anatomy of a Polar Bear also allows it to be a very good swimmer. They can be found up to 200 miles away from the closest piece of land. This is absolutely amazing to researchers, but it also indicates the distance that they are able to cover without any problems when it comes to swimming. They are fun to watch swim too because they do the stroke well known to humans as the dog paddle. They can also float for very long periods of time due to the amount of fat found on their bodies. It is estimated that their anatomy allows them to swim up to six miles per hour. There is no doubt by researchers that the Polar Bear anatomy has been a work in process over millions of years. They also assume it will continue to change to adapt to their current environment.